The Chinese and German Football Associations have made an agreement which will see the under 20 national team of China play 16 games in the South West Regional league which is Germany’s fourth tier. Originally they were supposed to play 19 games but 3 teams refused to play them amid fan protests. The teams who agreed will be paid 15,000 Euros for the game. The matches don’t count towards the league, and no points will be gained from the games which are supposed to prepare the Chinese team for the 2020 Tokyo Olympics. 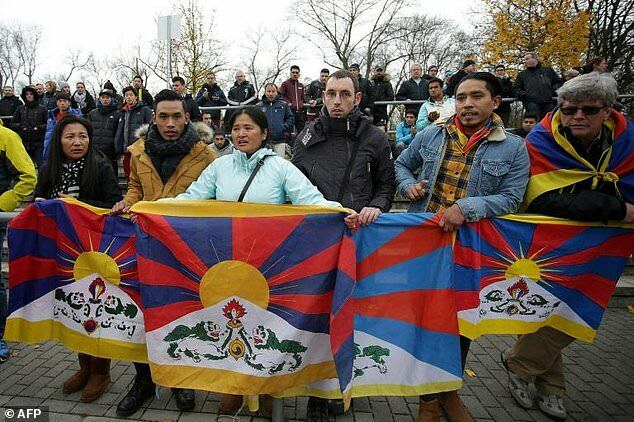 During the first friendly game against TSV Schott Mainz Tibetan flags were unfurled in the crowd, this made the Chinese team storm off and demand that the undesired flags be removed before they re-enter the field. As the games are being shown live back in China, I’m sure this was factored into the team’s decision. Had the Chinese team ignored the flags – 4 Tibetan flags and 7 protesters – and got on with the game, then this experiment with the German and Chinese FA’s would have likely passed under the radar without much attention being paid. Instead a huge storm has been caused, which from now on, i'm going to call Tibetan-Gate (as everything that causes a stir has to be a gate right?) Now it will likely follow them around all 16 games with the undesirable flags similar to that of Tibetan-Gate being seen regularly at the Chinese team’s matches. And let’s be honest if you want to wave a flag about to anger China, then there are quite a lot to choose from. Are the Chinese going to storm off every time something offends them or will they learn to stop being precious when they are outside of China? As this arrangement is apparently to prepare the team for the 2020 Tokyo Olympics, then you have to ask would they pull the same trick there or is the Olympics stage too big that it will make them play nice and show face? What of the German Football Association – if China wants to play in Germany surely they should told that they need to follow rules of the country they are playing in and not demand that their rules apply outside of China. "We cannot ban the protests, there is the right to freedom of expression here and certain rules apply. This is the German FA standing in the middle ground due to two things, firstly they will be happy with how much China is paying to allow their team into the German league system; even if they’re officially only friendly games. Secondly, if this goes well there will be more access to revenue streams for German football by setting up similar business-like agreements with China in the future. There has been discontent among German supporters regarding this current arrangement. Lower league clubs think the Chinese team are denying their right to be put into a higher division in order to have an even number of clubs. (Before the Chinese team were added, there was an odd number in the league). Is this a good or a bad situation for football in Germany and China? My opinion sways towards bad, and the reason for that is two pronged. One, with China only sending one national youth team to play that means only a select few will gain development benefits. They might think it’s an excellent idea short term if the team succeed and win gold in the Olympics, however long term they would be better off investing that 15,000 Euros per game in upgrading the quality in all aspects regarding youth football. For Germany it is a terrible idea regardless of what financial reward is on offer from a country mindlessly (it seems) pumping money into football without any clear direction. By allowing the under 20 side into the German fourth tier they’re denying opportunities that could have been offered to their own small clubs looking to develop German players. Looking into the situation from the outside and seemingly the only benefits gained for the Germans outweigh the negatives. The German side seems to be swayed only by the want of greed.